Feeling unmotivated or down in the dumps for no specific reason? Not sleeping well? Are you feeling irritable, negative and wishing you could teleport to somewhere warm where it’s sunny and 80 degrees year round? 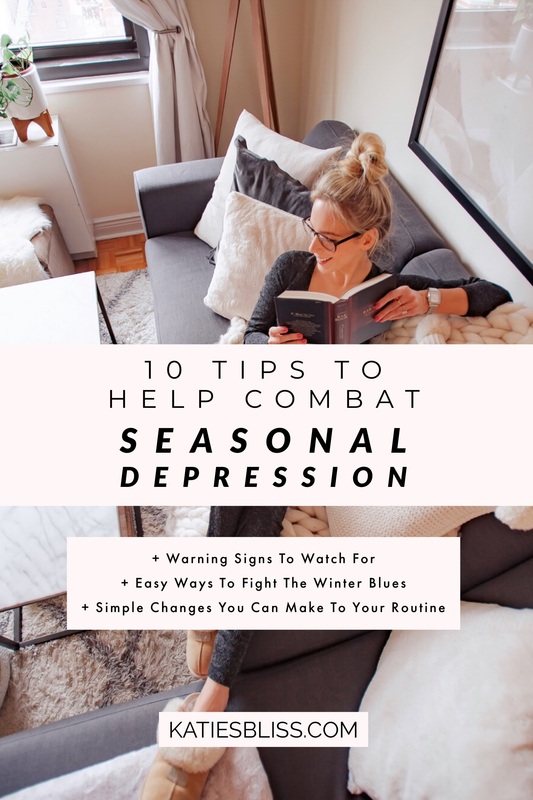 If this sounds like you, then you be suffering from Seasonal Affective Disorder (SAD) or as I like to call it: the winter blues. It was this time last year when I started feeling all of the things I just described above. I think it’s normal for anyone to feel a little bummed after the holidays, but to have a 24/7 negative mindset that lasts for weeks and affects your daily life, work and relationships? That’s a larger issue. Considering my history with anxiety, it’s not surprising how prone I am to SAD and looking back the signs were obvious. It took the arrival of spring for me to realize what I had been going through all winter. Experiencing longer days and warmer temps brought me out of my blackhole and immediately I started feeling like myself again. As soon as that happened, I made a mental note to myself that when winter rolled around again I would take the necessary steps to ensure I wouldn’t succumb to SAD again. So here we are in the thick of winter 2019 and I have to say, I feel really good. Definitely not that summer/fall kinda good, but all things considered, I’m in a wayyyy better place mentally and physically than I was this time last year. Curious to know how I’ve warded off the winter blues? Here’s what I’ve been doing to stay active and boost my mood. I’ve learned that I’m a much more productive and positive person when I exercise. I actually started prepping for my inevitable winter slump back in November by forcing myself to 3x weekly pilates classes. I book my classes at the beginning of every week and given that they are non-refundable, I have no choice but to go (unless I want to lose my $$$.) At first it was tough finding the motivation to get to class, but now I am obsessed! It’s become routine to me and I don’t view going to pilates as a chore. Last year I relied on my gym membership and ended up not exercising nearly as much as I should’ve. I’ve found my workouts are much more productive when I go to a confirmed class that’s lead by an instructor and I’m happy to say that since November I’ve consistently made it to pilates at least twice a week. I really look forward to going and LOVE my workouts. I like to go around lunch time so I have an excuse to leave my apartment during the day and get some sun and fresh air. This goes along with my last tip! While the lack of daylight and tough weather conditions of winter seem like good reasons to stay indoors, it’s so important to resist the urge to hole up at home. Fresh air and sunlight is good for the soul (no matter the temperature) and even just a quick walk outside can help lessen the symptoms of SAD. My life changed so much more for the better when I became a morning person. If you want to know I did it, I explained it in this post (for yearssss I could never wake up early.) I know it’s easier said then done, but when the sun sets in the late afternoon you gotta do what you gotta do to get that vitamin C. Here are a few ideas for how to make your routine more daylight friendly… If you typically exercise after work, try switching to your workouts to mornings. Trying setting your alarm earlier so you can walk to the office instead of taking the subway. Enjoy your lunch break outside and do a quick circle around your block. Even just a few minutes can make a big difference! When I opened up about my SAD on Instagram, so many of you recommended I try light therapy. I recently ordered this LED light therapy box and use it for a few hours everyday while I’m working on my computer. 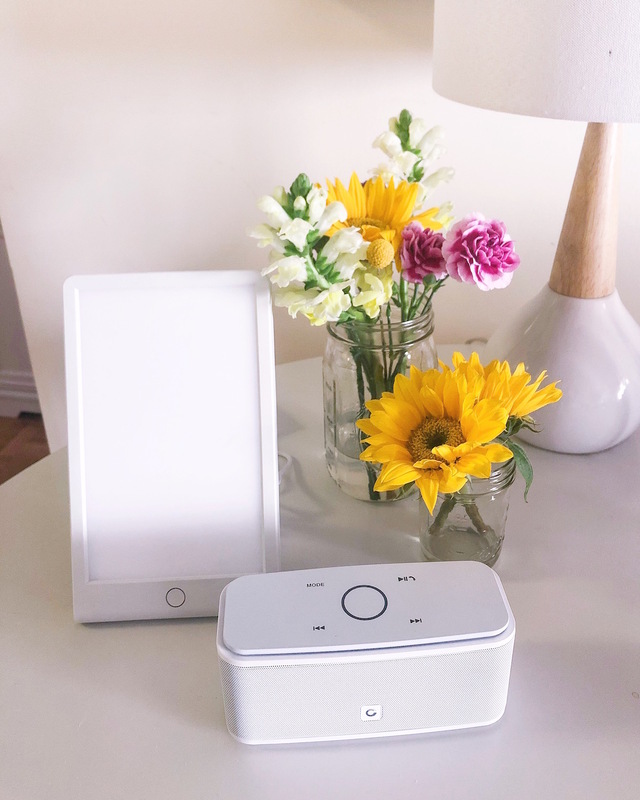 It essentially mimics natural light and helps regulate the body’s circadian rhythms that can get thrown off by days with shorter periods of light. If you don’t have the ability to get outside during the daytime or you live somewhere where the weather is bleak, using a therapy light can be a great tool to help combat the winter blues. One of the best things you can do for yourself during the winter is to keep busy. I find that I when I have too much extra time on my hands, I have a tendency to get wayyyy to into my thoughts and feelings. Since I work from home, I make a point to spread out any meetings, appointments, errands and fitness classes throughout the week so I have something to do every single day. While it’s very easy to just sit on the couch at home all weekend, during the winter I try and plan at least one fun thing that will get us out and about, whether that’s trying a new restaurant or going on a walk. Looking for something that will keep you busy at home? Winter is a great time to take on an organizational project or pick up a new hobby. Try some different recipes, teach yourself a skill, treat yourself to a few new books— the list goes on! If you have the ability to take a trip somewhere sunny and warm, there’s no better time of year to do it then in the winter. When my grandparents told me they were planning to rent a house in Florida again this year, I POUNCED at the opportunity and planned a visit over a three-day holiday weekend. Winters can feel dreadfully long when you live in northeast, so breaking up those cold months with a quick sunny getaway can really be a lifesaver. Of course I recognize that not everyone can just hop on a plane to Florida. 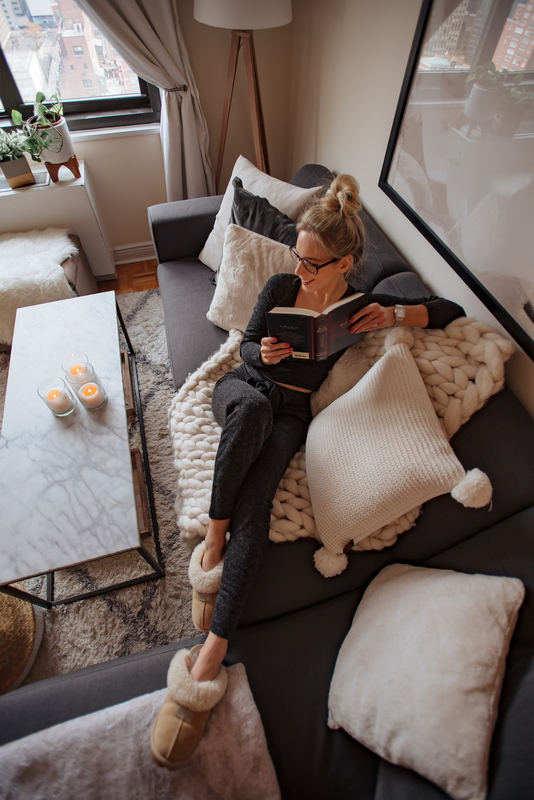 Sometimes just taking a weekend trip to visit a friend in another city, taking your Netflix binge over to a family member’s couch or spending the afternoon exploring a new place can be a very welcome breath of fresh air. Here’s another idea: if you typically work from home, grab your laptop and head to a coffee shop for the day. You’d be amazed at the positive energy you can gather just by working from a different setting. This tip may sound silly, but I swear I feel so much better about myself when I have a glow to my skin. I remember last winter feeling so icky when I’d look at myself in the mirror and immediately be reminded that it had been months since I was last out in the sun. 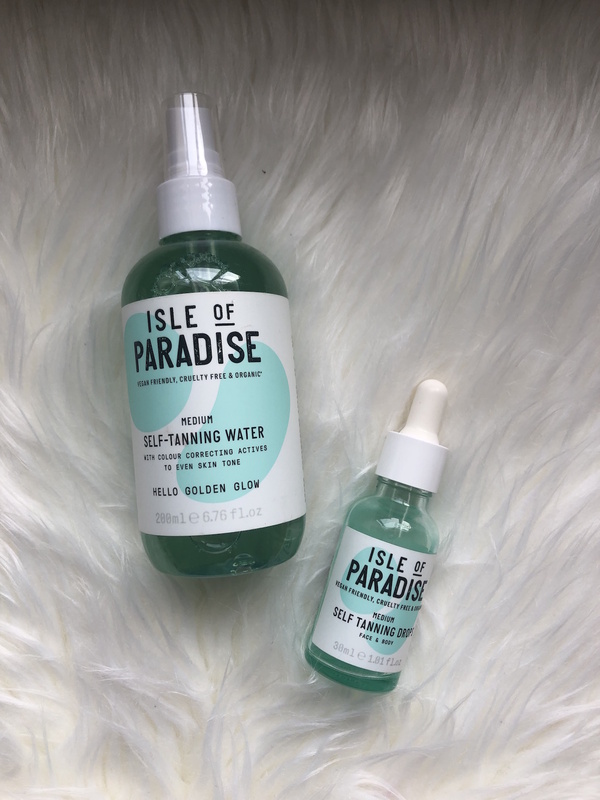 I discovered these awesome tanning drops that are so easy to use and give amazing natural results! All you have to do is a mix a drop or two with a pump of your body lotion or face cream and apply to your skin. The more drops you use = darker glow! Giving yourself a sunless tan is a simple way to boost your mood and confidence— just try it and you’ll see! Click here for a full review + more info on my favorite tanning products. It’s easy to want to hibernate during the winter. I know firsthand that the urge to avoid human contact can get real on those nasty cold days, but getting out and being around other people is so important when you’re prone to SAD. I find that catching up with a friend, doing a meeting in-over coffee or just eating my lunch out (vs taking it home) can completely flip a day from negative to positive. This is another tip that’s easier said than done, but can really do wonders for your mind and body. I’ll admit that I don’t have the best diet. I love me some fried things and regularly snack on junk food, but I try my best to incorporate healthy and fresh food into my diet. I stopped drinking soda about two years ago (I only buy sparkling water) and I start every morning with a lemon turmeric detox water. During the week I’ll stick to healthy salads and proteins and then on weekends I let myself splurge a bit on fun stuff (aka pizza and burgers.) I find that when I make a point to eat healthy foods, yet don’t aggressively restrict my guilty pleasures I feel so much better. It’s all about balance! What are some of your tips for combatting the winter blues? Anything else I should add to this list? Working out definitely helps! Also, having a trip to look forward to, even if it’s not for a while! My friend recruited in the northeast years ago and always commented how dreary grey it was compared to the mid-Ohio weather. Even going to Walmart is a nice get out of the house break during the winter. I make sure I have to go to all corners of the store for something!!! Of course, I forget something (or actually look at my list!!) and have to go across the store again. I hope to get into a better workout routine at home on our machines this year. Watching the TV helps. When it’s not so cold, lots of dog walks!!! I always enjoy getting south to FL. We have a place just south of where you were this weekend. I have a renter from Massachusetts who almost didn’t come this season after losing her wonderful husband in the fall. Her friends and family encouraged her to go. She went with a friend and was so happy to get away. She sounds wonderful! I was so grateful for her! Of course, the skirt outfit is darling. And really like the workout turtlenecky thing, too…comfy! Hey Katie, I agree with you, you need to keep busy during the dark winter months and try and keep a positive attitude and keep busy. I only recently learned about the winter blues and it explained so much about my mood! Great post!